Meet Matt Hill, Systema's owner and instructor. This year Matt's aim is to go deep inside Systema. The health aspects, the healing, the combat, the emotional management, dealing with people and situations. In short, how to better understand yourself, your environment, and those around you. This is where Systema begins. You plant a seed inside and help it to flourish. This is the essence of the Systema approach to self-defence, health, and wellbeing. You can't learn it. You have to live it. Accommodation is camping. Tent or tarp won't be supplied, please bring your own tent or tarp. The course is suitable for men and women of all ages and skill levels. You will train by day and night in open and closed environments. Range of work covered: grappling, striking, ground, standing, multiple person scenarios, weapons, crowds. 07:00 Systema health session. Recovery and preparation. Breathing, stretching, mobilising, and healing of the body, mind, and spirit. 08:30 Breakfast then morning training. 13:00 Lunch then afternoon training. 19:00 Dinner then night training. You will get a lot of information during the course of the week. You need time to process and absorb it. It is also hugely beneficial to have the time to just sit and reflect, taking the time out for yourself. Breathwork: for health, psychological state, and self-defence. Health: learn to use the principles of Systema to improve overall health and wellbeing. Movement: enhance and free your movement and responses in any terrain and situation. Strikes: working to find the relaxed heaviness that allows for free, fluid, and deep strike work from any body part. Tactics: how to use positioning, terrain, and obstacles. Awareness: the outdoors is the best place to open your senses and improve your level of awareness. Kit packing: lean kit packing is a skill. Learn what is essential and non-essential for five days in the woods. A full kit list is provided. Fire lighting: probably the key survival skill. Feel the deep sense of satisfaction of being able to get a fire going without matches. Navigation: a dying art. Learn the basics of navigation by map and compass. Tarp and hammock: ever spent a night under the stars? This is the ideal time to try sleeping in a hammock or bivvi-bag under a tarp with the forest as your walls and the stars as your roof. Of course, you can stick to a tent! 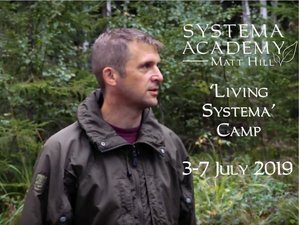 Matt Hill is the owner of his Systema Academy in Wiltshire in the UK. He started training in the martial arts in 1987 and by 1991 was living as a full-time student of the famous Aikido Teacher Morihiro Saito Sensei in Iwama, Japan, where he lived for two years. Matt began his study of Systema in 2003. Matt is a qualified Systema instructor under Vladimir Vasiliev, a 5th-degree black belt in Aikido and an ex-Parachute Regiment Captain. He teaches full-time at his Systema Academy as well as leading seminars throughout the UK, and around the world. This camp will take place in Heytesbury Wood, UK. Spending time in nature will help you relax and reset. There is something elemental in sitting around a campfire in the evening with friends. It is a timeless way to share the training, experience, and let the day sink in. All food is cooked over an open fire. It is hearty, healthy, and nutritious. Vegetarian and vegan options are catered for. Certain optional health boosting experiences are also available, such as cold water dousing. Experience the refreshing vigour and health benefits of outdoor bathing! Please book your flight to arrive at Bristol Airport (BRS), Bournemouth Airport (BOH) or Southampton Airport (SOU). You can then get public transport to Heytesbury. You will then be picked up from the bus stop in Heytesbury and taken to the camp. Matt's Systema Academy offers a holistic solution for the mind, body, and spirit developing natural, healthy people, able to defend themselves and others. The prices below include an early bird discount of 51 GBP. To benefit, book or reserve before June 2019.